I have a bad memory when it comes to little, unimportant-in-the-grand-scheme-of-things items that need to get done. As a result, I use my iPhone’s calendar as a reminder to pick up milk, call the cable company, pay bills, buy gifts, or do just about everything else that needs to be done by a certain time. It works for me because as soon as something enters my head, I can get it down in my calendar and not worry about it until it comes up on a date in the future. 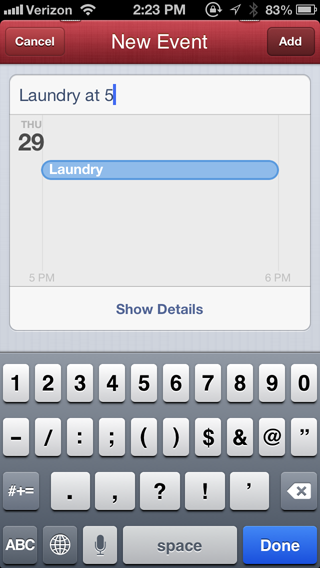 Because I create calendar items several times throughout the day, I quickly learned to hate the iPhone’s built-in calendar app for many reasons; the worst of which is how long and how many touches it takes to create a new calendar entry. It’s just not very quick and it’s very easy to make a mistake or overshoot a date or time you’re trying to schedule something. So, I went looking for a replacement calendar app. I settled on Calvetica because it has a very easy to use creation screen for new items, it uses the iPhone’s built-in calendar (which is very important since I sync it with my work’s Exchange server), and has a few options which I find absolutely necessary to keep my life in order. However, there are a few things about Calvetica that I dislike, so I’m always on the lookout for a better app. Today, I found out about Fantastical and after seeing a video or two and reading what some others had to say, I decided to give it a try. It’s really well done and I would like to use it as a replacement for Calvetica, however it’s missing one absolutely necessary feature, and one I’d really like to have it feature. First off, when you create an entry, you use natural language. If I want to pick up milk on my way home, I’d write in “Milk at 6” and Fantastical will create an appointment called “Milk” and set it to 6 p.m. Brilliant! If I need to get a haircut on Saturday, I’d write “Haircut Saturday at noon” and BAM! Saturday at noon a calendar event called “Haircut” gets created. Fantastic! You can even use dictation to speak your appointment if your iPhone supports it. The natural language entry is a step above Calvetica, especially for non-same day appointments which require a few additional touches in Calvetica. Natural language entry and a somewhat better appointment list interface make me want to use Fantastical over Calvetica. The one feature that’s keeping me from switching is that Fantastical does not have a default alarm, nor does it honor the iPhone’s built-in calendar setting. An appointment at 10 p.m. to set my alarm clock for the next morning is useless unless I’m reminded to do it! To set an alarm, I have to create it, then edit it and set the alarm. Calvetica has a default alarm setting, and so does the built-in calendar app. Fantastical not having this feature is a showstopper for me, and the reason I can’t switch to it full time. The other feature that Calvetica has that Fantastical doesn’t, and this falls into the I’d really like to have it category, is a badge with the current date on the icon in the home screen. 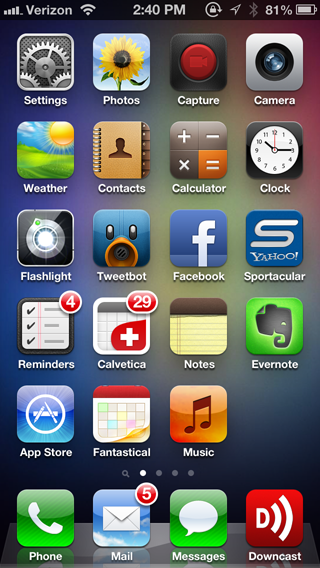 Only Apple’s built-in apps can have icons that change on the home screen, like display the current date, but the makers of Calvetica use the notification badge to display the current date – it looks like I have 29 unread items, but actually, it’s Calvetica’s way of telling me today is the 29th. It’s not a showstopper, but it is a nice feature to have and one I would like to see Fantastical implement. Calvetica has a better interface when editing an event, allowing you to change days and set the beginning and ending time with ease, while Fantastical uses an interface similar to the built-in calendar app. I definitely prefer Calvetical’s interface, but again, Fantastical’s interface is not a showstopper since I rarely edit events after I create them. I know this sounds silly, but I’m actually really excited about Fantastical’s natural language entry, and as soon as they implement default alarms, I’ll begin to use it as my iPhone calendar app.